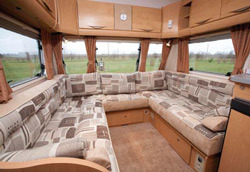 Bailey has just taken one of its most popular caravans and built a single-axle version with an amazing lounge. Could this be the best Bailey yet? The Series 6 Bailey Senator California is yet another take on the nearside fixed bed, rear washroom caravan, with one very big difference: it has a U-shaped lounge. The result is much more seating space, much more space in which to put your feet up and relax – and a much more open-plan, airy aspect to the living area compared with the traditional parallel settees arrangement. Another benefit of a U-shaped lounge is that at night time it makes a much larger double bed than layouts with a central chest of drawers. Half of the caravan’s length is taken up by its bedroom and en suite shower room but it still offers a spacious living area and, importantly, plenty of kitchen surface space, too. Returning to the Bailey’s cosy ambiance after each day’s sightseeing expeditions was a joy. In particular, its kitchen configuration works really well: four-burner hob offset to the oven/grill, giving surface space around it; microwave – and an ingenious removable drainer wall-clip that also gives you a place to hang a dish-cloth. LED strip-lights illuminate the whole area in a warm green hue, stretching over both sink and hob – a million miles more refined than any illumination the standard white tungsten strip-lights can offer. Lighting is an impressive feature of the shower room, too. You have four spotlights. Two are above the large mirror (you can check your attire from top to toe here) and the second pair illuminates the washbasin area from a ceiling plinth. In addition there’s a central ceiling light. But there’s another feature of this shower room that distinguishes the new California: a Truma heated towel rail that’s part of the blown-air central heating system. A duct at floor level directs warm air up into the towel rail and a series of small outlets on each of the two rails allows warm air to dry your towels. Don’t expect speedy drying, but it’s a million miles better than the usual towel loops. Towing was a delight too due to the AL-KO ATC Traction Control system which comes as standard on Senators. It’s just one part of an excellent value package that, for little over £15,000, gives you a built-in flatscreen television, inboard water tank and heated towel rail. 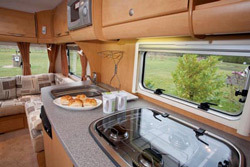 Bailey has taken one of its most popular caravans and built a single-axle version with an amazing lounge. It offers plenty of space and after four days of living in it we decided that it is high up among the easiest caravans to live in we have yet to encounter. 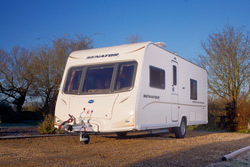 *Caravan insurance cost based on 2009 Bailey Senator California valued at £15,695, fitted with hitchlock, wheelclamp AL-KO axle wheel lock and ATC trailer control (standard on this model). Kept on drive behind locked gates at HX2 7RZ. Caravanners over 30 years old, claim free for 3 years and a member of a caravanning club. Premium includes insurance premium tax at 5% and 10% online discount and is correct as of 24.06.09.